Walks take place at 20:00 on the first Sunday of each month. So you think your house is haunted? Don’t worry – help is available and what is even better, it is completely free. Beware of anybody who asks for money for rescue mediumship or spiritual healing. These gifts come from spirit free and they should be shared free. There are a lot of things that happen to people which at first seem to have no obvious scientific explanation. Look closer and for some of these there is a rational explanation, but the fact is that hauntings do happen, and when they do it can cause a lot of unhappiness. Forget what you see on Most Haunted and TV programmes like that: real ghosts are not fun, they are unpleasant. For instance here we have the Daily Mail story of a family haunted by a poltergeist. Not in a castle, just an ordinary family home. Durham has more than its fair share of troublesome spirits, and having researched them (and sometimes moved them on) for more than ten years Durham Paranormal Research Group has a lot of experience. Confidentiality is an important part of the service, because if you have a spirit problem the last thing you want is to have your home turned into a media circus. However it means we cannot name-and-shame the managers of the charity shop in North Road, Durham that is threatening to sack any of their workers for complaining that there is a frightening presence in the back shop. What an Employment Tribunal that would make! This photograph was taken in the Black Horse pub in Tudhoe, The owner, who has now left the pub, complained of poltergeist activity and asked us to sort it out. Drinks were being thrown off tables, electrical equipment ( including a £1000 plasma TV) was damaged beyond repair. As she was telling me this a red mark appeared on her arm and started to bleed. 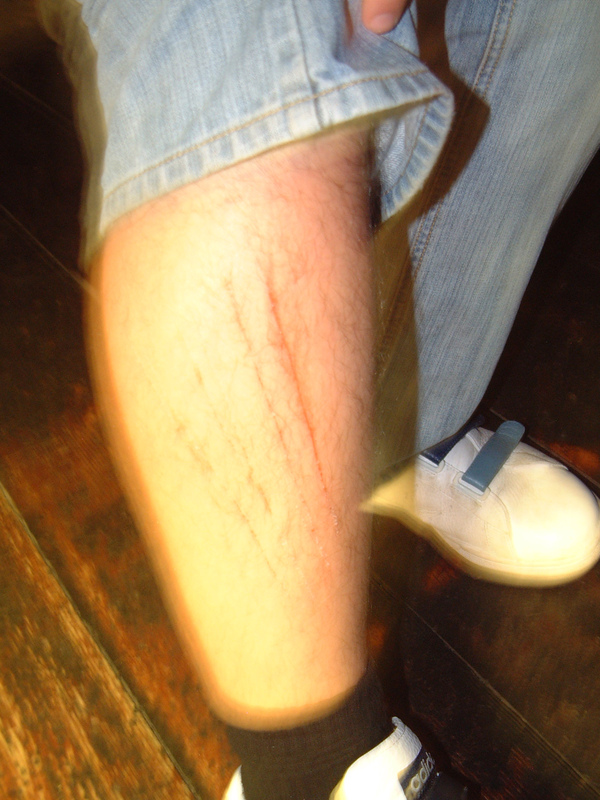 The next day at an overnight paranormal event at the Castle Keep, Newcastle, the attendant at the Keep suffered the same sort of injury on his leg. Interestingly, look at this photo of the Queens Chamber seconds before the attack. The yellow lines are fairly common on photos in poltergeist locations. Going to an overnight paranormal event like this is fun, but having a real life poltergeist in your home is one of the worst things that can happen to a family. It has been described as being like having rats in your home, but a thousand times worse. We cannot guarantee to move them on, and neither can anyone else because there are so many sorts of things that go under the general term of "ghost." By all means have your house blessed by the local vicar or priest, but there are lots of kinds of "ghost" that do not respond to that. Particularly worrying is the growing number of people who report that they are suffering from night paralysis attacks. Typically the person (usually female) wakes up in the middle of the night with a feeling of overwhelming weight pressing down on their body. They feel paralysed and try to scream but cannot. In extreme cases they feel as if they are being penetrated sexually, often violently as in the movie The Entity. Usually the person goes to their GP who diagnoses the problem as a condition known as Sleep Apnea. Without a doubt many of the night paralysis problems reported are due to this medical condition, and if the patient is very overweight then this is more likely. However there are a proportion of cases, especially when marks of the sort shown at the top of the page are symptoms, where other causes need to be considered. If you are suffering from this sort of problem then we would recommend doing an internet search on the spirit creatures known as Incubus and Succubus as well as the Alien Abduction phenomena. This is probably the most distressing condition that is covered by the general term "ghost" and in practise seems to share a lot of characteristics of both the demon of medieval witch trials and the 21st century shape-shifting reptilian alien. Often the attacks are accompanied by poltergeist activity and the longest lasting case we have on record has continued intermittently for at least 25 years. If you are suffering this sort of attack please do not continue to suffer alone. Please contact us immediately, we will believe you and there are a number of possible remedies for this very distressing phenomenon. The spirit is asked to do something, typically in a spiritualist ceremony to give evidence of continued existence to somebody who used to know them: in a black magic ritual the spirit might be commanded to harm someone, carry out an immoral act or predict the future. Finally the spirit is "banished" or asked to leave the circle and return to where it came from. This is a vitally important part of the ritual that is often ignored. Think of, say, using a ouija board, which is a very common cause of unwanted spiritual disturbance because the spirits associated with the board are low-grade spirits or "lower entities". The spirit is invited to appear by the act of setting up the board and saying things like "Is there anybody there?" Then the spirit is invited to move the slider on the board around to answer questions. When the fun and games are over nobody thinks of telling the spirits to go away again, apart from the fact that no attempt has been made to put some sort of control over them in the first place. Okay... now you have invited evil into your life and you have the spiritual equivalent of a swarm of flies in your home. Flies, spiritual or otherwise, take no notice of holy water or blessings by priests. You have a problem of your own making. Amateur attempts at "magic" are often successful unfortunately. Aleister Crowley, the self confessed black magician said, "Any action carried out with intent is a magickal act." In other words if you really believe that your magical ceremony is going to work and you put a lot of emotional and physical effort into it, and repeat it often enough then eventually it will work. Even if you have not studied lots of old books of ceremonies and know none of the names of the fallen angels, your sincere intent is enough to send out dark vibrations into the unknown. Not recommended. Spiritually uninitiated people are like a small child facing an open door leading to a dark forest. Think really hard before stepping through that door by yourself. Finally, there are some houses where bad things have happened and this can leave a sort of spiritual stain. If you are house hunting and you come across a house where the atmosphere is not quite right then avoid that house at all costs. There is an old proverb that "Like attracts like." There are unpleasant spiritual entities that feed and grow stronger on negative emotion and they are often the most difficult to deal with. At the first signs of paranormal activity, be aware and do something. If you are involved in occult/paranormal things, including overnight paranormal events and ghost walks (even ours!) then stop. Get rid of the literature and try to stop thinking about the subject. Over the centuries the mainstream religions such as Roman Catholicism and Church of England have gained tremendous positive spiritual power through the billions of sincere prayers and devotion they have received. The Sign of the Cross, the Lords Prayer and the Rosary are all valuable emergency measures even if you are not a devout Christian. Take Holy Communion or Mass if you are entitled. Alternatively find a registered Spiritualist National Union (SNU) church, tell them your problem and take some spiritual healing. These people are spiritual lion-tamers even if they have blue rinsed hair and look like your grandma. Trust them, they are the experts. As stated above, members of Durham Paranormal Research group are available to help if you think your house is haunted. This is a completely free service paid for by the proceeds of the Durham Ghost Walk, but please do not abuse it. We do not need prank calls, thank you.